Robust overseas sales, led by a 25.7% increase in sales to Latin America & the Asia Pacific (LAAP) region, propped up fourth quarter sales growth. U.S. net sales dipped 0.9% during the quarter to $210.4 million, while net sales to Europe, Middle-East and Africa rose 2.4% to $76.0 million and sales to LAAP reached $59.7 million. Sales in Canada rose 10.5% to $30.6 million. Favorable exchange rates padded net sales growth by three percentage points. 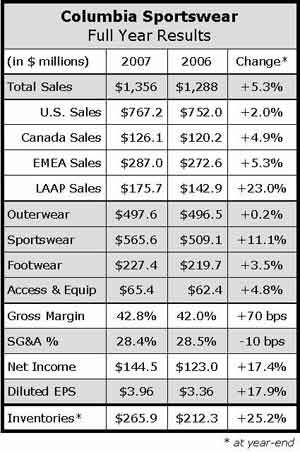 A break out of net sales growth by category for the quarter shows that outerwear inched up 1.0% to $182.2 million during the quarter; sportswear grew 7.1% to $116.2 million; footwear rose 7.4% to $60.6 million; and accessories and equipment grew 6.6% to $17.7 million. A breakout of net sales growth by brand for the quarter shows that Columbia grew 6.1% to $330 million; Mountain Hardwear grew 15.5% to $23.9 million; Sorel grew 3.1% to $19.8 million; Montrail decreased 22.7% to $1.7 million; and Pacific Trail fell 85% to $1.3 million. “We're pleased with our fourth quarter operating performance against an increasingly challenging retail and economic backdrop,” said Tim Boyle, Columbia's president and CEO. Boyle said he is comfortable with footwear inventories in the U.S., but said the company's outerwear inventories are about where they were this time last year. He said they have no intention to jettison either Montrail or Pacific Trail. Fourth quarter gross margins increased 80 basis points, thanks to favorable exchange rates, better margins at retail stores and lower freight costs. SG&A expenses increased 8% to $104 million, or 27.6% of sales compared to 26.7% in last year's fourth quarter. Net earnings set a record thanks to a significantly lower tax rate. Fourth-quarter profits rose 19% to $45.7 million, or $1.26 per diluted share, compared $38.4 million, or $1.06 per diluted share, for the year-ago quarter. The company's consolidated Q4 tax rate was 22.0% compared to 31.6% for the same period of 2006 thanks to favorable rulings in Europe. COLM expects its 2008 tax rate to be 33%. In 2008, Columbia will shift its spending from logistics and distribution to advertising and marketing. It will focus on opening 20 outlet stores and perhaps a few “first line” stores in major U.S. cities in an effort Boyle said was aimed more at enhancing wholesale distribution and better managing inventory than diversifying into retail. The retail expansion will allow Columbia to show consumers the full breadth of its brands as it ramps up marketing. This spring, Columbia will launch an integrated marketing campaign to drive sell through of its Omni-Shade apparel and Techlite footwear. In the fall, the campaign will shift to Omni-Tech waterproof breathable apparel and Techlite. The campaign will include POS signage, billboards, TV, print media and public relations. While conceding that more spending on retail expansion and marketing could undermine margins in 2008, Boyle said it would lead to higher long-term earnings. In Europe, Columbia will focus on rebuilding operations in countries where it sells direct rather than through distributors. In 2007, sales of Columbia outwear fell 16% in those markets even as they rose 18% in markets served by distributors. Columbia has placed European sales under Nick McCormick and new European GM Christian Finell, who joins Columbia with 17 years of experience at Salomon. The company expects its Sorel footwear brand to sell well in Europe and Asia, where it has enjoyed some cache among upscale retailers and consumers. While insisting Columbia has not seen “significant” cancellations of spring orders, CFO Bryan Timm lowered Columbia's sales guidance for the first quarter. The company now expects consolidated 2008 first quarter net sales to decrease approximately 2% from last year's $289.6 million. As recently as March, Columbia was forecasting a 4% increase. Timm attributed the lower guidance to lower-than-expected re-order rates and sales slipping into the fourth quarter of 2007 or the second quarter of 2008. He said the weakness is predominantly in the United States and related to Columbia branded product.